By 1791 Robert Stevenson was 19 years old and starting his engineering career — working for Thomas Smith, engineer to the Northern Lighthouse Board. The young man is described as having large features and a clean-shaven ruddy complexion, with grey eyes and chestnut brown hair, standing 1.7m (5ft 7in) tall. Smith and Stevenson were engaged on lighthouse projects together at a time when Smith was suffering private grief. He had married Elizabeth Couper (1758-1786) on 19th February 1778 and they had had five children, three of whom died young. This left the eldest child Jean (1779-1846) and her younger brother Thomas. After Elizabeth died, Smith had married Mary Jack (1762-1791) on 20th October 1787, and they had a daughter (Janet) before Mary too died. Stevenson’s mother, who had been a friend of both Elizabeth and Mary, moved with her son into Smith’s household to look after his three children while he was away on lighthouse business. They became close but before they could marry, they had to find Jean’s errant husband. This they did and a divorce was procured in 1792. Though Stevenson was only 20 years old at the time, and appeared as a witness in the court proceedings (with Smith and lawyer John Easton) over the divorce, he was never to tell his own children or descendents about his mother’s second marriage. She was a very religious woman and perhaps he wanted to spare her feelings — he even omitted to note it in the family Bible, where other significant dates were inscribed. Jean Hogg married Thomas Smith on 14th November 1792. They had one daughter Elizabeth (1796-1803), known as Betsy, to whom Stevenson was much attached. During the winters of 1792-94, Stevenson attended classes in natural philosophy at Glasgow University. These were delivered by Professor John Anderson (1726-1796), a former soldier with interests in field artillery and experimental physics, the latter of which gave rise to the nickname 'Jolly Jack Phosphorus' bestowed on him by the students. Anderson directed Stevenson towards an engineering career. During the summers, he assisted Smith with lighthouse work such as reflector installation and building maintenance. He also gained experience by working on the construction of Little Cumbrae Lighthouse (1793) and Pentland Skerries Lighthouse (1794). The first was a new lighthouse on the west coast of the islet of Little Cumbrae in the Firth of Clyde, built for the Clyde Lighthouses Trust to replace the original lighthouse (1757) atop the centre of the islet. Stevenson had more involvement with the second, at Pentland Skerries south of the Orkney Islands, where he supervised construction for the Northern Lighthouse Board. He was to rebuild it in 1821-30. From 1796 until 1802, Stevenson was apprenticed to Smith. However, from 1797 onwards he exercised considerable autonomy in the firm's lighthouse work, beginning with Cloch Lighthouse (1797) on Orkney for the Clyde Lighthouses Trust. His career was becoming established. Stevenson had grown to love his stepsister Jean Smith, also known as Jane. They married in Edinburgh on 3rd June 1799. His stepfather was now also his father-in-law, as well as being his mentor and friend. Stevenson continued to develop his engineering vocation by attending classes at Edinburgh University during the winters of 1800-04. He studied mathematics, natural philosophy, chemistry and natural history. He was never to gain a degree yet always recognised the value of learning. By 1802 he was in full partnership with Smith and had celebrated the birth of his first child, another Jean (1801-64). He then embarked on the construction of the last two lighthouses with which Smith would be involved. Both were for the Northern Lighthouse Board and the first was at Inchkeith (1803-04) in the Firth of Forth, near Edinburgh. The second was at Start Point (1806) on Sanday in the Orkney Islands, where it replaced an unlit masonry tower and had the first revolving light of any Scottish lighthouse. The Stevenson family was marked by the tragedy of infant deaths but also cheered by the births of two sons who did survive to adulthood — Alan (1807-65) and Robert (1808-51). The boys attended the same school until 1821. In 1808, Thomas Smith retired from business and as engineer to the Northern Lighthouse Board. 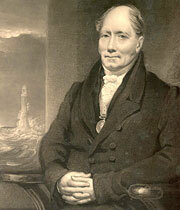 Stevenson was appointed Smith’s successor on 12th July that year, by which time the 36 year old's reputation as a lighthouse engineer was assured. His most famous work — Bell Rock Lighthouse — was to be his next adventure.